The Tennessee State Employees Association was established in 1974 as a non-profit Association representing the interests and rights of state employee members. TSEA is one of the largest independent state employee organizations in the country, and one of the most successful at improving the salaries, rights and benefits of state employees. TSEA is a united group of active and retired state employees from all branches of state government working together toward the goals of an effective and efficient state service where the workplace is attractive and rewarding for a quality career workforce. TSEA is governed by a 19-member board of directors made up of TSEA members elected by their peers. The future initiatives and goals of the Association, in addition to any amendments to the Association Constitution or changes to the Bylaws, are determined by the TSEA membership each year at its annual Representative Assembly. Members are also involved at the local level through 47 chapters across the state. Address itself to the full and swift solution of any problems not specifically suggested herein which involve the interests of state employees in their relations with either the administrators of state government or the citizenry of the state and its representatives. We are the TRUSTED voice for state employees. Our mission is to protect state employee rights and lobby for improved pay, benefits, and working conditions. 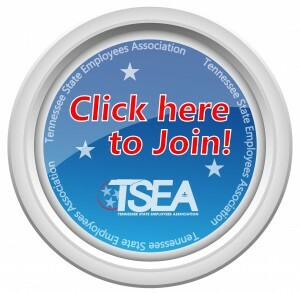 TSEA is an Association that was founded by state employees more than 35 years ago to assure that they would have protection, advocacy, and representation in all areas of their rights and benefits as employees of the State of Tennessee. TSEA is a membership-driven, service oriented, respected organization that represents state employees in the workplace, in the General Assembly, and to the public. TSEA staff provides employees with the most current information about state policies and procedures. We advocate on their behalf to ensure that employees are being treated fairly and consistently. TSEA’s significant lobbying efforts in the General Assembly are vital to maintaining and improving all employee rights and benefits. We Advocate for better pay. We Lobby for improved benefits and working conditions. We Protect and Defend the rights of state employees in the workplace. We Inform our members of legislation, major events, and policy changes through mailings, emails, Twitter, and Facebook for the up-to-the-minute news you need to know.